Are there any tools that can generate classes from anonymous types? I have a complex data structure that I have created using anonymous types. I would like to use this data structure in other places where the anonymous type would be out of scope. That's why I'm looking for such a code generation tool. That's one of the refactorings supported by Resharper. With nested anonymous types (where one anonymous type has properties of another anonymous type), you'll just have to convert the inner types before you get the option to convert the outer one. I found another way that does this without using Resharper. It is tested on VS 2015.
and after that a light bulb appears near the first line and when you click it, it shows you options that will generate this class for you, wherever you want. Here you can see what am I talking about. 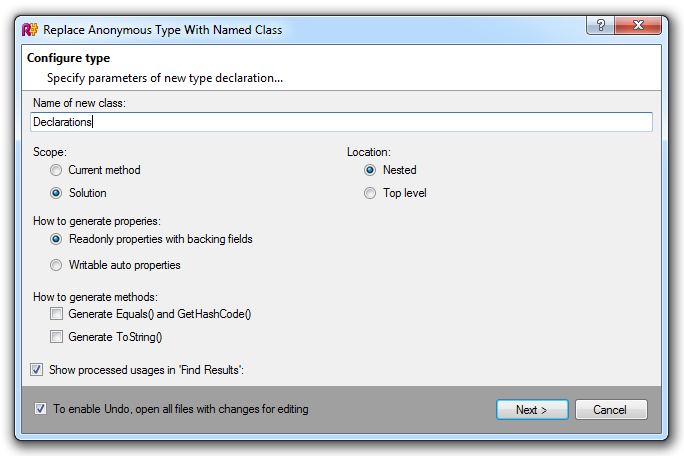 The Convert Anonymous to Named Type refactoring converts anonymous types to nested or top-level named types in the scope of either the current method (locally) or the whole solution (globally). In the dialog box that this refactoring provides, you can also specify whether ReSharper should generate auto-properties or properties with backing fields, and opt to generate equality and formatting method overrides. CodeRush supports this with it's Name Anonymous Type refactoring.